"Kenneth Shinozuka designs smart products ... He's been doing so since he was in kindergarten. When he was six years old, a family friend of Kenneth Shinozuka fell down in the bathroom. The friend was ok -- but the incident inspired him to design a motion detection system that could be embedded in bathroom tiles. He never actually made one in real life (remember, he was only six) ... but he was hooked on both the promise of invention and the potential of technology. In some ways, Kelton Kostis is a normal 13-year-old. He plays video games, hangs out with friends and goes to bed late. But while most boys his age are in the eighth grade, he’s working toward his master’s degree at Bellevue University. Stephanie Mui is pretty sharp at math. Which makes sense. She has been working to master the subject since she was a little kid. According to Mui, she was learning addition and multiplication in preschool, and really, she just kept rolling. Mui proved to be so bonkers good at math that after fifth grade she started taking community college courses. A set of quadruplets have a big decision ahead of them — Harvard or Yale? A budding software developer wanted to connect with her grandma in Hong Kong. ...12-year-old Emma Yang, one of the recipients of the “Ten Under Twenty” innovation awards announced at this year’s CE Week conference in New York. Her creation, called Timeless, is an app that serves to help Alzheimer’s patients, their caregivers and their families. In eighth grade, she was selected for the CTY Scholars Program, a four-year scholarship program through which underrepresented students take CTY’s summer, online, and family programs, and receive academic and college advising. Luz spent CTY summer sessions at Lafayette, Haverford, and Princeton, taking courses in zoology; biotechnology; and science, technology, and public policy. She also took an online AP Statistics course. At 15, he began a master’s degree in maths and computer science at Massachusetts Institute of Technology (MIT) and a year later, he is in the top six per cent of his class. But the teenager never went to school. Instead, he learnt everything he knows from bingeing on online courses. Moshe Kai Cavalin has two college degrees, but he's too young to vote. He flies airplanes, but he's too young to drive a car alone. Life is filled with contrasts for Cavalin, a 17-year-old from San Gabriel, California, who has dashed by major milestones as his age seems to lag behind. He graduated from community college at age 11. Four years later, he had a bachelor's in math from the University of California, Los Angeles. While most teenagers are enjoying their summer vacation by sleeping until noon and catching up on the latest video games, Jaylen D. Bledsoe was at MegaFest (a family – friendly festival founded by the T.D. Jakes Ministries) speaking on the topic of technology and innovation. Noel Jett is the perfect person to study for a doctorate in gifted and talented young people. Tanishq Abraham, 11, graduated from American River College in Sacramento. “This isn’t much of a big deal to me,” said Abraham, who graduated with a 4.0 and three associate’s degrees just one year after Today reported that he had successfully completed California’s early-exit high school exam. In his address, Govan called for action from the young people in the audience, challenging them to get interested in politics and to vote. "We also need to become leaders, to become government officials, which many of us don't want to do," he told the crowd. "But hopefully the professionals and teachers here will encourage the rest of us to do so..."
Cerulean juggles his passion for the show with school, homework, and piano and drama lessons. He loves the show's fast pace and the way it revolves around facts, he said. Inspired by his desire to keep his grandfather safe, a 15-year-old from California invented a device that could help millions of Alzheimer’s disease patients. Kenneth Shinozuk’s grandpa lives with Alzheimer’s and often wanders off in the night, according to the teen’s project page on the Davidson Institute for Talent Development website. His aunt, the primary caregiver, was losing sleep trying to keep this from happening. After failing to find a device to prevent this, Kenneth realized he would have to create his own... Read more at Davidson Fellows or listen to his TED Talk: My simple invention, designed to keep my grandfather safe! People can easily forget that everyone online is a person, and often that means they don’t think twice before posting something insulting or hurtful about someone. 14-year-old Trisha Prabhu decided to fix that with software that makes people give a second thought to what they’re posting online, and it’s working. Xiuhtezcatl Roske-Martinez is only 14 years old, but already he's a seasoned superstar in the world of political and environmental activists. Enter his name — an Aztec word pronounced "Shu-TEZ-caht" — on a search engine, and nearly 5,000 results pop up. Andy Merrill is a huge pi fan. The 13-year-old from Libertyville wore a pi shirt every day during Pi Month, March 2014, aka 3.14. But more amazing is what he can do with a computer! Johnson, a student at Marcus Garvey Elementary, knew that he and his classmates could also see their school doors closed, so he did what most of us wouldn’t dream of doing at age 9, he began campaigning and calling out local politicians, including Mayor Rahm Emanuel. When 12-year-old Peyton Robertson sees a problem, he is going to fix it. So when the young scientist noticed a perennial problem in his hometown of Fort Lauderdale, Florida –flooding during the region’s nasty hurricane season – he set to work building a better sandbag. Peyton's ingenious sandbag (and Peyton’s “commanding delivery, innovative thinking, and sound grasp of the scientific method”) won him first place in the prestigious Discovery Education 3M Young Scientist Challenge. He was the youngest winner in the contest’s history. In addition to the $25,000 award and a trip to Costa Rica this summer with the other finalists, he got lots of love from the media, including an adorable spot on The Ellen DeGeneres Show. He’s also filed for an open patent so that others can use and build upon his design. In fact, he currently has three pending patents. Musician Emily Bear has composed more than 350 pieces for the piano. She's recorded six albums, performed at the White House and Carnegie Hall, and worked closely with her mentor, music legend Quincy Jones. And get this: She's 12. Ethan shares his love of music with others! So it becomes even more mind-boggling to realize that, on Friday, a 19-old-year high-schooler was given an award for developing an artificial intelligence that will dramatically lower the cost of self-driving cars. Ionut Budisteanu, the Romanian teenager who’s $75,000 richer thanks to the award, wanted to find a way to get rid of Google’s high resolution 3-D radar. He said Google didn’t worry about cost while developing the technology, and the high-res 3-D radar was the most expensive part. Without it, the cars would be far cheaper. On Saturday, Walter will graduate with a bachelor of science degree in mathematics, physics and economics, a triple major in the J. William Fulbright College of Arts and Sciences. He is accomplishing the feat at age 18. What makes his accomplishment even more impressive is that he has a severe form of muscular dystrophy that forces him to use a motorized wheelchair. "NBC Nightly News" recently profiled McGarry during its evening newscast. McGarry is fast becoming one of the hottest names on the culinary scene. John Sedlar, the head chef at Playa, allowed McGarry to take over his restaurant for one night. The culinary phenom produced a nine-course meal for a packed house. Entrees included trout with braised leaks and caramelized fennel, as well as a dish featuring nasturtium flowers. Did Sedlar have any fear in letting the teenager take over the kitchen? "I don't think it's risky at all because I've tasted Flynn's food," Sedlar told NBC. "This is as good as any restaurant in Los Angeles." Now 6, Lori Anne is the youngest contestant on record to qualify for the Scripps National Spelling Bee. Her ticket to the competition that begins Tuesday was the word “vaquero,” meaning cowboy, which she spelled correctly to win the Prince William County bee. But Speller 269, who will compete for $30,000, among other prizes, reports that she isn’t particularly nervous and isn’t cramming. Jack Andraka, 15, won top prize at this year's Intel International Science and Engineering fair for his new method to detect pancreatic cancer! Based on diabetic test paper, Jack created a simple dip-stick sensor to test blood or urine to determine whether or not a patient has early-stage pancreatic cancer. His study resulted in over 90 percent accuracy and showed his patent-pending sensor to be 28 times faster, 28 times less expensive and over 100 times more sensitive than current tests. One more article, this time from Forbes magazine, Wait, Did This 15-Year-Old From Maryland Just Change Cancer Treatment? After graduating from Xavier University with a 4.0 average in both chemistry and pre-med, 18 year old Asia Matthew went looking to beat the odds. She wanted to enroll at the prestigious University of Massachusetts Medical School in a selective PHD/MD program. Only the best get in. Hundreds apply and the school annually interviews only 40. From that group, between seven and ten are chosen. “I was nervous,” she admitted. “It’s hard not to be. This is the one thing that I’ve wanted for a long time and when you see it almost at your fingertips, you don’t want to do anything to let it slip.” Asia beat the odds and got accepted, a great coup for her and Xavier. But Asia isn’t making the journey on her own. Her identical twin sister Ashley is going too! Richelle Zampella is in the fifth grade. "I like being outside and listening to music and playing with my sister," said Zampella. Pretty much a typical 11-year-old girl. And Richelle loves to spell. "She's a go-getter. You can't give her things fast enough," said Cindy Lumpkin, her teacher. The "Okie from Muskogee" is one of two students heading to the Scripps National Spelling Bee in Washington. And she just may be the hardest working girl in bee business. Taylor Wilson believes nuclear fusion is a solution to our future energy needs, and that kids can change the world. And he knows something about both of those: When he was 14, he built a working fusion reactor in his parents' garage. Now 17, he takes the TED stage at short notice to tell (the short version of) his story. "I started out with a dream to make a star in a jar, and I ended up … making things that I think can change the world." "My daughter used a blank memo pad and some markers. We uploaded the flip book using the Iphone app "Animation Creator" Hints: use markers that don't bleed through the pages. Start at the bottom page of the memo pad so you can trace the previous picture and just change each frame gradually. Use just the bottom portion of your memo pad so your pictures will animate when you flip through them." MIT'16 Early Admissions Tube goes to Near Space! "My seventh grade science teacher showed us a size comparison video on cells, and I thought it was fascinating. I decided to make my own interactive version that included a much larger range of sizes," said Cary in an email forwarded by his mother. "It was not a school project -- just for fun. However, my science teacher loved it so much she showed [it] to the class! My brother, Michael, helped me put it on the internet." Thomas Suarez is a 6th grade student at a middle school in the South Bay of Los Angeles. When Apple released the Software Development Kit (SDK), he began to create and sell his own applications. "My parents, my friends and even the people at the Apple store all supported me," he says, "and Steve Jobs inspired me". 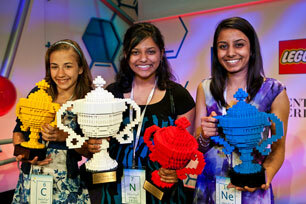 Google Science Fair 2012: How can I improve the human condition? Google Science Fair 2012: How can I reduce the carcinogens in grilled chicken? Lauren, a 2011 Google Science Fair winner from Pennsylvania USA, explains why her experiment about carcinogens was inspired by her evening meal! Among the lesser-known but nonetheless depressingly impressive details in Ms. Portman’s altogether too precociously storied career is that as a student at Syosset High School on Long Island back in the late 1990s, Ms. Portman made it all the way to the semifinal rounds of the Intel competition. For high schooler Ryan Patterson, inspiration struck in the unlikely setting of a fast-food restaurant over an order of burgers and fries. "I was trying to think of a science fair project to do, and I thought, 'What have I seen over the past year that I can try to improve? What needs to be done?,'" recalled Patterson, an 18-year-old student at Central High School in Grand Junction, Colo. "Then I remembered a time when I was at the same restaurant and saw some people who were deaf who needed an interpreter to help them place their order. I thought I could try to develop an electronic method that would make it easier for people to communicate."